The start was fantastic, the middle more of a mixed bag, whilst the end was ultimately disappointing. Exeter’s hopes of advancing in this season’s Heineken Champions Cup hang in the balance after they slipped to defeat against Castres. This loss, coupled with last week’s home draw against Munster, mean Rob Baxter’s side currently sit bottom of Pool Two and facing an uphill struggle if they are to stand any chance of progression. Devon’s finest will need to win at least three, if not all four of their remaining fixtures, to give themselves any hope of reaching the quarter-finals. It will be a tall order for sure, but stranger things have happened. Having opened up with a share of the spoils in Round One against Munster, the Chiefs landed in the South of France looking to inflict further European woe on their hosts, who themselves were beaten at Gloucester in their opening fixture. Ahead of kick-off, Baxter was forced into change with Dave Dennis, Dave Ewers and Sam Skinner all ruled out having picked up injuries against the Irish province.Into the fray came Ollie Atkins, Wilhelm Van Der Sluys and Tom Lawday, the latter two making their first-ever European starts for the Devonians. Castres, meanwhile, were at full-strength, welcoming back into their ranks Antoine Titchit and Daniel Kotze in the front-row, former Leicester Tiger Steve Mafi in the engine-room and Vaipulu at No.8. However, their first actions were to try and repel the Chiefs, who started this encounter at a rate of knots. Keen to stamp their authority from the outset, it was a jet-propelled opening spell from Baxter’s side, who were looking to run their rivals ragged with a fast-tempo approach. 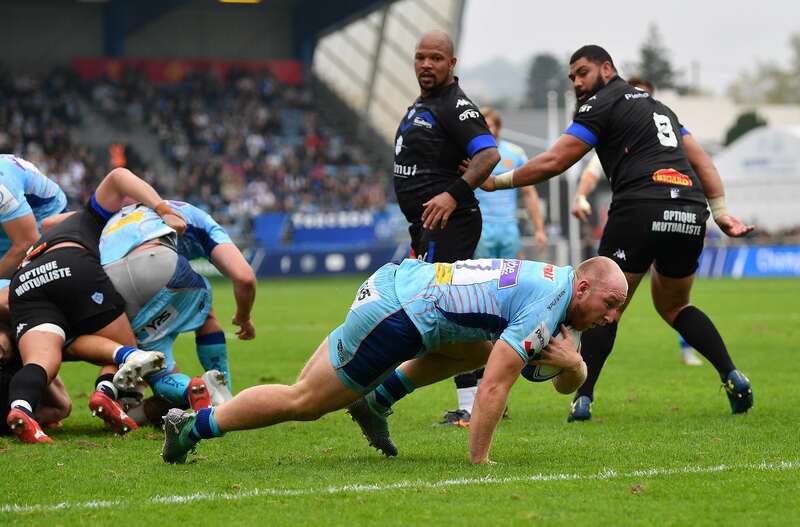 Castres withstood the opening skirmishes, but when the visitors threatened again on eight minutes, this time they could do nothing as Exeter crafted a lovely opening for Santiago Cordero. Still with plenty to do, the Argentinian flyer showed footwork more akin to Strictly Come Dancing to glide his way through the heart of the home defence and score by the posts. Gareth Steenson slotted the extras to that score and Exeter’s second try, which arrived just moments later through Matt Kvesic, who was able to pick an unconventional route through the middle of a Chiefs driving maul just five metres out.The former Gloucester man not only caught out Castres, but also referee John Lacey, who wanted to review just how he had snuck through. TV replays confirmed what the Travelling Tribe already knew, sparking scenes of huge delight amongst the Exeter contingent who had gathered in numbers for this first-ever visit to the Stade Pierre Fabre. It was the dream start for Baxter’s side, who had clearly heeded their leader’s pre-game war cry to start the game with a bang. Castres were rocking on the ropes, but they regrouped impressively to hit back with a score of their own inside three minutes. The juggernaut home pack made the hard yards, before it was spun wide to centre Florian Viaelle, who cut a smart line through the Exeter midfield to score unopposed. Julien Dumora landed the easy conversion before then drilling over a penalty after Luke Cowan-Dickie was singled out by Lacey for infringing as the Chiefs looked to clear their lines with a counter-attack. The Castres playmaker was enjoying a stellar spell, conducting his team-mates to all corners of the ground. He cut the deficit with a drop-goal from in front of the sticks, before successive penalties put his side in front for for the first time. Exeter’s failure to fully combat the aggressive Castres forwards at the breakdown, plus the different interpretation shown by officials in this competition to that of the Premiership, meant the Chiefs were coughing up a mounting penalty count. 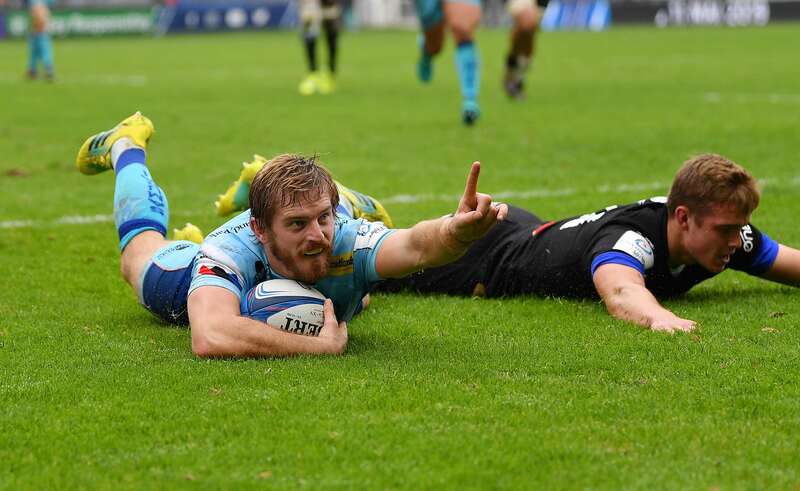 That said, the visitors were handed an unexpected boost just before the break when Castres were reduced to 14 men. No.8 Maama Vaipulu was the man sent off, his shoulder high hit to Luke Cowan-Dickie looked crude on first viewing and got distinctively worse the more it was replayed on the big screens. Up a man, it didn’t take the Chiefs long to make their numerical advantage tell. An attempted box clearance from Yohan Le Bourhis was masterfully charged down by Steenson, who was quickest to react to the loose ball. Still with plenty to do, the Irishman hacked the ball on, before winning the subsequent foot race to the try-line. Sadly, the normally deadly Irishman could not convert from the right touchline, leaving the scores level at the turn. With little to choose between the two rivals after an absorbing first half, it was the Frenchmen who were afforded the first chance after the restart. The Chiefs appeared to have the shove on at scrum time, but again Lacey ruled in favour of Castres.Le Bourhis - on for the injured Dumora - sized up the shot at goal, but his long-range effort sailed wide of the target. It was, however, a momentary let-off for the Chiefs as in their next foray forward, the reigning Top 14 champions bagged their second try. Feeding Steve Mafi midway inside the Exeter half, the Tongan international brushed off two tackles before rounding Phil Dollman to score the try, which was duly converted. Although down a man, Castres were sticking to their task well and even though they leaked a penalty of their own after Don Armand was felled by a high tackle, Le Bourhis responded in kind with a kick of his own after the Chiefs were too slow to the breakdown when prop Alec Hepburn looked to make ground out of defence. The penalty count was certainly a concern for the watching Baxter, who turned to his bench in a bid to add some fresh impetus to his side’s attacking endeavours.Castres, too, started to add fresh muscle, including South African Rory Kockott, whose clever box-kicking was helping to pin the Chiefs back at every conceivable opportunity. Both sides huffed and puffed as they looked to deliver a telling blow, but defences were holding firm. Steenson’s second penalty just past the hour mark helped to bring the visitors back to within four points at 29-25. As the minutes ticked by, so the natives started to become more vociferous in their support of their side. Every kick, every tackle, every meaningful action was met with a wall of triumphant noise. Exeter needed to be on the front foot, but when Cordero was snagged fielding a high ball, it was the hosts who pounced quickest. The impressive Vialelle hacked on possession, sparking a sprint to the line between himself and Henry Slade. The ball itself looked destined to go dead, but in his attempts to cut off his rival, Slade was adjudged to have impeded his opponent. The incensed home crowd demanded sanction.Referee Lacey again reviewed the matter, the results of which saw the England international banished to the sin-bin and the home side awarded a penalty. Le Bourhis stepped forward once more with the kick, but this time his effort was well wide of the far post. The Chiefs were living dangerously, a point underlined when Le Bourhis saw a long-range drop-goal attempt cannon back off the post just two minutes later. At the other end, though, the Chiefs were still very much in the fight and when Steenson thundered a penalty kick of his own to within five metres of the home line, the platform was in place for them to strike. Unfortunately, the resultant line-out was a mess, Castres flying up high to challenge Atkins, but knocking the ball on in the process. Now offered a scrum from which to work with, the Chiefs again could not prosper as they conceded another untimely penalty. Not only did that curtail their final attack, but it allowed the home side to see out the dying seconds. For the Chiefs, Europe now takes a back seat until mid-December where they will brace themselves for back-to-back encounters with Gloucester. Nothing less than two victories will suffice as Baxter’s side have entered into the ‘Last Chance Saloon’. Castres: A Batlle; M Laveau, R Ebersohn (T Combezou 63), F Vielle, T Paris; J Dumora (Y La Bourhis 33), L Radosavljevic (R Kockott 53); A Tichit (T Stroe 35), J Jenneker (P Sauzaret 68), D Kotze (W Hounkpatin 68); S Mafi (V Moreau 73), L Jacquet; M Babillot (capt), B Delaporte (A Tulou 73), M Vaipulu. Chiefs: P Dollman (J Simmonds 74); J Nowell, H Slade, I Whitten (S Hill 58), S Cordero; G Steenson (capt), S Townsend (J Maunder h/t); B Moon (A Hepburn 48), L Cowan-Dickie (J Yeandle h/t), H Williams (T Francis 48); O Atkins, W Van Der Sluys (T Salmon 68); D Armand, M Kvesic, T Lawday (S Lonsdale 58).